Parking: Apart from a few busy days in the summer parking is relatively straightforward at Bouley Bay and in common with most areas in Jersey it is free. It is always worth checking that the hill climb isn’t being held as there is no access to the bay in those days. There is a reasonable amount of parking at Bonne Nuit but it is slightly busier during the summer month. Most of the year though parking at Bonne Nuit is not a problem. This page covers the central section of the north coast of Jersey. Refreshments: During the summer months there are a number of options but at other times it is not so simple. At Bouley Bay there is the Black Dog pub and Mad Mary’s Cafe but in the winter the nearest place for refreshments is the Trinity Arms. There is a large cafe at Bonne Nuit but during the quieter months of the year the nearest options are La Fontaine Pub and the cafe at St John’s Sports Centre. Launching from the slip at Bouley Bay can be tricky at times. In recent years it has become slippy, at times dangerously so, and towards high water swells can create a challenge. The slipway has a right angled bend in it, if the tidal level is above the bend and there is any swell then launching can be problem. Once afloat though Bouley Bay offers some of the most sheltered waters on the island. Head towards the pier, which was built in 1828, before heading north towards Vicard Point. 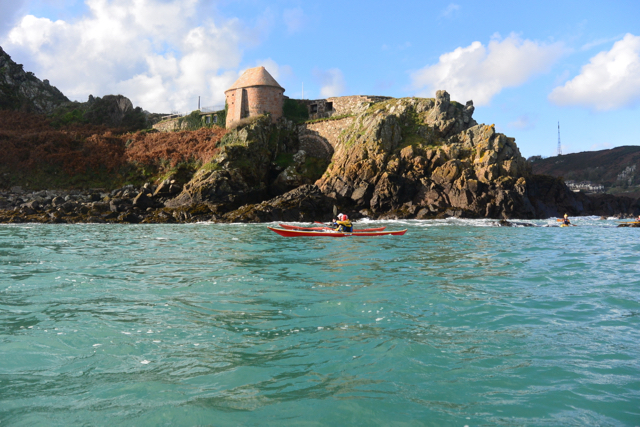 Above the pier can be seen Fort Leicester, one of the holiday lets available from Jersey Heritage. People often fish from the end of the pier, so avoid becoming entangled in their lines. Heading west and north from the harbour the next small headland is Vicard Point. A small but significant race can develop here when the water is flowing north, which it does most of the time. Le Petit Port is the small rocky cove to the west of the headland and is an area, which is frequently visited by local paddlers, although the reason isn’t immediately obvious from the sea. In the trees just above the small cliffs on the western edge of the bay is a small cottage known as Wolf’s Lair. This building must be the most isolated from a road in Jersey. Although there is a good path running down from the cliff top, the easiest access, particularly if carrying equipment is by kayak. 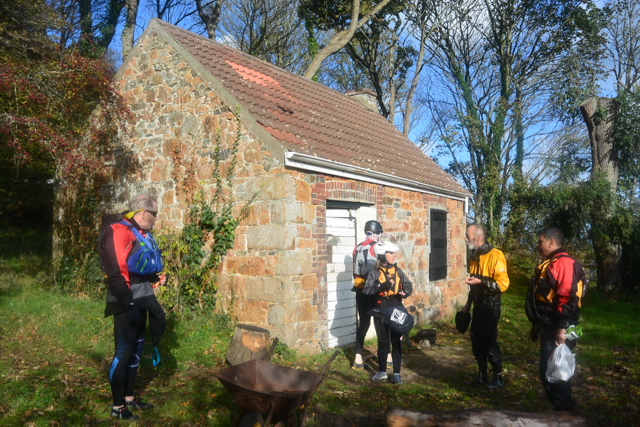 The Jersey Canoe Club has been responsible responsible for the running of this delightful building, which must be one of the remotest in Jersey, since the 1970’s. When work first started on its restoration in the 1970’s it was totally run down. A new roof had to be put on and the inside was divided into 3 small rooms. The early 1990’s saw the inside completely renovated and there is now sleeping accommodation for about twelve people. On a warm summers morning there can be few finer places to eat breakfast prior to starting a days paddling. Although the building is well over a hundred years old it is in the 20th Century that the most interesting events have taken place in its vicinity. During the Second World War it was the site of a landing by Allied troops on the night of 25th/26th December 1943. Without seeing any Germans during their brief visit the leader, Captain Philip Ayton, was seriously injured when he trod on a mine and he was to later die from his wounds. A plaque commemorating the landing, Operation Hardtack, has been placed close to the entrance to the cottage. The second dramatic event occurred in October 1964. The Jersey based motor yacht, Maricelia, left St Malo for St Helier. She was caught in storm force winds with a gust of over 90 knots in Jersey. In terrible conditions, near to Corbiere, the crew were thrown into the water, only Alison Mitchell survived. She was carried by the tidal streams and washed ashore in this little bay after nearly 20 hours in the water. She then managed to struggle up to Lower Egypt Farm, an incredible feat of endurance. Continuing west from the small landing place at Egypt, Belle Hougue is the next headland. It is the tallest in Jersey and a considerable race develops here on both the flood and the ebb. If there is any swell running then the waves can break heavily over the offshore reefs. The area around Les Sambues is probably the most interesting for those in search of white water excitement. Fast moving water pours around the rocks when they are uncovered and stationary surfing waves form when they are submerged. In close at Belle Hougue there are numerous passages to be explored and at the western edge of the headland is Belle Hougue cave. Access is difficult from the land and when it was first entered, in 1914, it contained stalagmites and stalactites. Inside there have also been discovered the antlers, teeth and bones of a small species of deer which is unknown anywhere else. Belle Hougue is a dramatic and awe inspiring location which demands respect in certain wind and tidal conditions. It is also often the first place that the effect of the westerly swell can be felt, when paddling along the north coast. From Belle Hougue it is two miles to Ronez, the next headland, which is normally clearly visible, but many people will want to head in towards Bonne Nuit. First it is necessary to cross Giffard Bay. Its eastern edge is marked by a group of rocks, Le Long Echet, which are said to resemble a dead man lying down with his feet and nose pointing upwards. It could just as easily appear like a living person lying down. The similarity is most easily seen from the car park on top of the cliffs at Les Platons, rather than on the water. On low water springs a sandy beach is revealed in Giffard Bay. On warm sunny days it is a perfect place to land for lunch but if there is a swell running then it can pick up surf. Although it is not a particularly popular location so you are likely to have the waves to yourself. The western extremity of Giffard Bay is marked by La Crete Point with its small fort, which was built in 1835, although the site has been used for military purposes since the 16th Century. Today it is possible to rent the fort from Jersey Heritage, as a holiday let. Slightly to the north east of Bonne Nuit Harbour is Cheval Rock, also known as Le Cheval Guillaume, it was a tradition on Midsummer’s Night to paddle around the rock as it was supposed to bring good luck and to increase fertility. The modern paddler will probably want to travel somewhat further than his predecessors but the rock is worth a closer look as part of a longer trip, particularly if there is a swell as quite an entertaining wave can develop. Bonne Nuit pier was built in 1872, to provide shelter for local fishing boats, a role it still fulfills today. 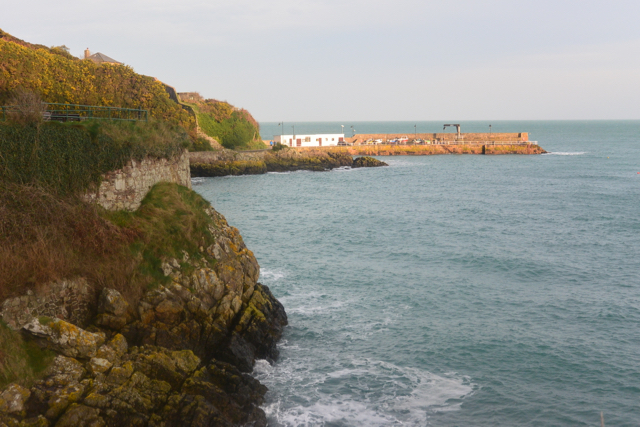 In common with Bouley Bay, the beach has a reasonably steep gradient, meaning that the tide doesn’t go out that far. This means that Bonne Nuit is suitable as a departure and arrival point at all stages of the tide. 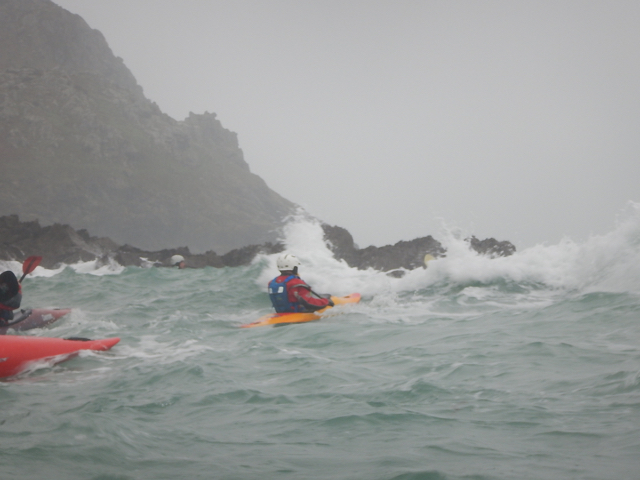 Be aware that all the waypoints have been taken from a sea kayak, in a relatively close position to the location. The position may not always be appropriate for larger craft. A morning high tide at Bouley Bay, therefore it is a spring tide. Wolf's Lair Cottage at Egypt. A perfect place to spend the night. 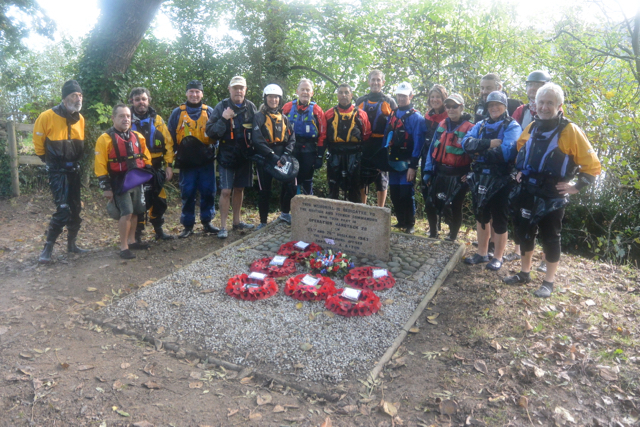 The Jersey Canoe Club regularly observes the 2 minutes silence on Armistice Sunday in November, at the memorial for Operation Hardtack. Close to the cottage at Egypt. Heading west towards Belle Hougue on a grey and windy Sunday morning. Heading west past La Crete Fort.